As far as reasons to visit Vietnam go, its beaches are far less known than Vietnam’s other attractions — but that’s quickly changing, as formerly sleepy fishing villages have seen far more moolah coming in from tourists than from the day’s catch. With over 2,000 miles of coastline, it was inevitable that Vietnam’s beaches, in places like Nha Trang, Mui Ne and Da Nang would finally rise in the rankings of hot beach destinations, alongside established places like Phuket and Boracay. Find out what locals have known for ages — the next time you visit, try and fit one of the beaches below into your Vietnam itinerary. Perhaps it’s only fitting that an island named after a famous Russian cosmonaut offers a majestic 360-degree view of Ha Long Bay at its peak and a compact but tourist-friendly beach at its base. “Ti Top” is the closest Vietnamese approximation to Gherman Titov’s name. Titov was the second man in space, having spent a whole day in orbit in 1961 aboard Vostok II. Titov visited Vietnam and Ha Long Bay on Ho Chi Minh’s request in 1962, and the former Cat Nang Island was renamed in his honor. After making the 400-step climb to the viewing deck and back, finish your visit with a few hours’ swimming or sunning at the beach — a touristy 130-yard stretch of sand with deck chairs and drinks sellers. The white-sand beach is surprisingly clean, as the favorable currents sweep any pollution away from the island. Getting here: book a tour of Ha Long Bay that includes a stop at Ti Top Island. Close to Ha Long Bay but far enough to offer a less touristy, more nature-grounded experience than its popular neighbor, Quan Lan Island on Bai Tu Long Bay rewards tourists for stepping off the beaten path. You can choose from several beaches to visit on the island, but you can’t go wrong with Minh Chau Beach: an arcing 1.5-mile-long stretch of white sand lapped by calm waves. The fineness of the sand is a big draw for visitors; if you’re looking for more action on the ground, rent volleyball equipment from one of the local providers, or rent a lounge chair or hammock if you prefer something more sedentary. A beachfront restaurant scene operates on the island during peak season, from May to October. Getting here: A ferry from Ha Long Hon Gai Port takes a scenic route through Bai Tu Long Bay to Quan Lan island, at a port south of the main village. Few beaches balance out a mountain backdrop and a curving boundary between sand and sea quite the way Thien Cam Beach does. In fact, the beach’s grandeur has been immortalized in legend, the sound of its waves so entranced a king, he renamed the surrounding area “Heaven’s Lute” (or, Tien Cam in Vietnamese). As remote as Thien Cam is, history has not forgotten the place — the 13th-century Yen Lac Pagoda can be seen in the area, and travelers interested in local cuisine can visit the Cua Nhong fishing village where they continue the traditional craft of making nuoc mam, or fish sauce (an ideal condiment for every Vietnamese meal you’ve ever had). Getting there: Thien Cam Beach is some 20 miles from the nearest large city, Ha Tinh, and another 200 miles east of Hanoi. Buses regularly service the long haul from Hanoi to Ha Tinh; from the latter, you can either ride a taxi or a local bus to go to Thien Cam. 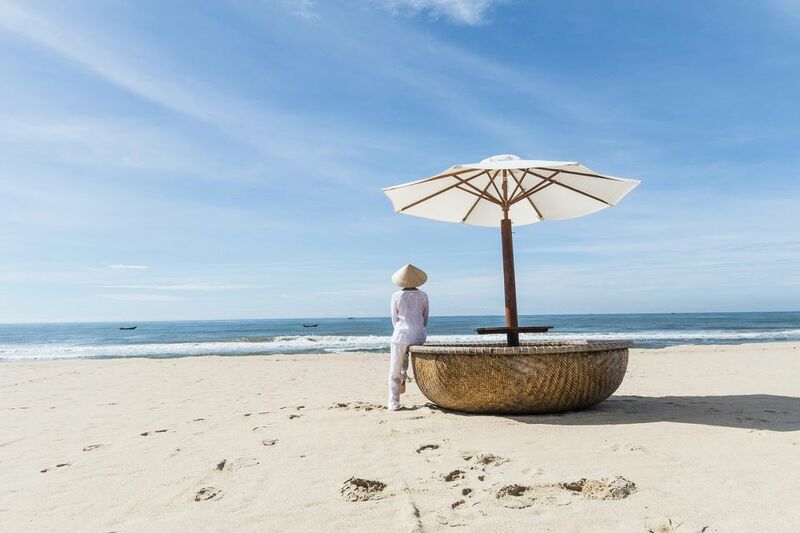 The beaches in Hoi An feel somewhat overshadowed by the ones in nearby Da Nang, but that’s not a problem for visitors to Hoi An: the more they have this rustic beach near the historic town to themselves, the better. This four kilometer stretch of dirty-white sand near Tra Que Village is quite a departure from the sleek overcrowded beachiness of Da Nang. Instead of glitzy beachside bars, you’ll only find scruffy watering holes selling basic cocktails and good vibes. For the price of a drink, you’ll be allowed to rent a lounge chair to use on the beach and watch the stand-up paddleboarders master their balance on the calm waters. How to get here: Da Nang (and nearby areas like Hoi An) are serviced by the Da Nang International Airport (IATA: DAD, ICAO: VVDN), with flights from both Hanoi and Ho Chi Minh City. Hire a xe om to take you here and back. The busy, resort-like feel of the Da Nang beachfront belies its Vietnam War background. Part of this beach served as a rest and recreation spot for American GI’s, who nicknamed its southernmost sector “China Beach”. The present-day Da Nang beachfront – composed of Non Nuoc, Bac My An, My Khe and Pham Van Dong beaches – take up about 18 miles close to the city center, its promenade transforming into a Riviera-like collection of high-end restaurants and hotels that yesterday’s GI contingent could only have dreamed of. Some five-star resorts have snapped up sections of the beach for their guests’ private use, but there are enough “public” parts for you to enjoy. Getting here: The beach is directly accessible from the city. Direct flights from Hanoi and Saigon arrive multiple times daily at Da Nang International Airport. Strangely enough for a tropical island, beach pickings are slim on the Ly Son islands off Vietnam’s south-central coast — except for the ones on its second-smallest island. The Anh Binh (Little Island) beach looks completely undeveloped, situated as it is on a 7-hectare island with about 100 permanent households. The volcanic cliffs framing the white sand and the rowdy waves look positively unspoiled, its main drawback being the lack of tourist facilities on the beach. Getting here: Regular flights from Hanoi and Ho Chi Minh City fly to Chu Lai International Airport, from which taxis and buses cover the thirty miles to Sa Ky port. Alternatively, you can ride a bus or train to Quang Ngai City, from which you can ride a taxi or bus to Sa Ky. Ferries from Sa Ky to Ly Son connect the mainland to the island district. From the Great Island, you can take tourist boats to An Binh. The curving Ky Co Beach feels like Vietnam’s most pristine beach. It has to be: it’s far from the town center, requiring a car ride along remote roads or a quicker ferry to get here. The local cliff formations make up Ky Co’s most instagrammable backdrops, particularly the Ong Dia rock at the northern end of the beach. Cliff-jumping into the strong currents is possible from this point, but only recommended for the strongest swimmers. Younger visitors will enjoy the rock pools carved out of the limestone near the beach. Getting there: Ky Co is nearest Quy Nhon in Binh Dinh Province. Phu Cat Airport connects visitors from Hanoi and Saigon to Quy Nhon. Alternatively, you can ride the train to Quy Nhon’s Dieu Tri Station, or ride the bus. Boat packages from Quy Nhon explore Ky Co Beach as part of an itinerary that reaches nearby Hon Seo, Hon Can and Yen Islands. Canoe rentals from nearby Eo Gio Bay to Ky Co can also be arranged. It’s as touristy as all-get-out, but Tran Phu Beach is part of the consummate Nha Trang experience. This 3-mile stretch of beach serves as the Nha Trang metropolis’ eastern edge, skirting the namesake Tran Phu Street and its promenade. Tran Phu Street’s restaurants, hotels and museums — many dating back to the French colonizers, who made Nha Trang their favorite seaside retreat — elevate the local beach experience. When you’re tired of the sun, sea and crowds, beat a hasty retreat to the promenade’s many restaurants, or check out adjacent tourist sites like the Po Nagar Cham towers and Long Son Pagoda’s towering Buddha statue. Visitors to Tran Phu feel like they’re right in the middle of the action, which can be both good and bad. Nha Trang's accessibility draws tourist levels that may get a bit too crowded during peak season and holidays. Getting here: Nha Trang is accessible from either Hanoi or Ho Chi Minh City (Saigon) by air or by train. Nha Trang may be Vietnam’s hottest beach destination, but its crowds and touts can get old, fast. Good thing there’s a secluded alternative just an hour-and-a-half bus ride north from the city center. Doc Let Beach stretches for some 4 miles north to south, a gently curving beach with bright-white sands and shallow blue waters. Casuarina trees shade the sands, and a few rustic resorts offer some refuge to visitors. The easygoing local resorts allow day-trippers to access their facilities for a fee, even without an overnight stay. Parasailing, jetski and camping equipment rentals can be had here, at rates much cheaper than you’d find at Nha Trang. Camp on the beach overnight so you can catch Doc Let’s scenic sunrise first thing in the morning. Getting there: Doc Let lies about 25 miles north of Nha Trang. The air-conditioned #3 busrides hourly from Nguyen Thien Thuat Street in Nha Trang to Doc Let. Taxis will also follow the same route. This resort town in Phan Thiet Province is another fishing town made good, famous for its expansive sand dunes (great for sledding and ATV-riding) and kitesurfing (when the current and weather hits that sweet spot between November and March). The Mui Ne beachfront takes up 9 miles from northwest to southeast. A traditional fishing village still occupies the northwest part, slowly being displaced by high-end resorts. Guesthouses, shops and a smattering of boutique resorts occupy the eastern end of the beach. Getting here: Mui Ne is some 120 miles west of Ho Chi Minh City, taking a five-hour journey by bus to get here. Only two hours’ bus ride from Ho Chi Minh City (Saigon), Vung Tau practically explodes on the weekends, as city day-trippers descend on the area’s four beaches to unwind. The cleanest beach on Vung Tau – Bãi Sau, or Back Beach – is also the place to go for water sports like surfing, kite-surfing and kayaking, thanks to its favorable currents and wind swells. Facilities are ever-present, but aren’t free: you can rent storage, an umbrella, and showers on the beach, not to mention rentals of surfboards and other watersports equipment from local providers. Once you’ve tired of surfing on Back Beach, venture to the area’s other beaches — Front Beach, Paradise Beach and Pineapple Beach — or explore the city’s colonial architecture. A 100-foot-high concrete Christ towers over the city from Nui Nho (“Small Mountain”), offering stellar views of Vung Tau’s coastline to hardy tourists who brave the 800-step climb up. Getting here: Most weekenders take the bus from Saigon to Vung Tau and back. Transport provider Greenlines DP services a fast ferry from Saigon to Vung Tau. Another Vung Tau beach that benefits from its relative closeness to Saigon, the 10-kilometer Ho Coc Beach represents a rustic getaway much beloved to local tourists. Light gold sands, clean waters and a bustling al fresco seafood scene put Ho Coc top on many Saigon locals’ list of weekend getaways. But the beach isn’t all there is to this place: the Binh Chau Hot Springs, a collection of some 70 springs some 11 miles north of the beach offers a more therapeutic experience, with warm-to-searing spring waters giving much-needed relief to aching muscles and tired blood vessels. A mud bath experience is available for an additional charge. Getting here: Ride a minibus from Mien Dong Bus Station in Saigon headed to either Ba Ria or Vung Tau; from either stop, you can ride a taxi or motorcycle taxi (known as xe om) to Ho Coc Beach or Binh Chau. Vietnam’s largest island has a pleasantly varied ecosystem — half of it is a National Park, after all — and travelers get immediate access to all of Phu Quoc’s diving, waterfalls, wetlands, rainforests and, of course, beaches. The 12-mile Long Beach is the island’s most popular coastline, crowded almost end-to-end with hotels, resorts and restaurants taking advantage of the famous sunset view. The waters are crystal-clear, making an excellent backdrop for tourists lounging around on beachside cafes and bars. But why stop at Long Beach? Try visiting the 20 other beaches on the island, including the less tourist-covered Ong Lang and Bai Sao. Or look at what lies beneath the waves: scuba divers swear by Phu Quoc’s waters for their rich undersea life, including giant turtles and the slow-moving dugong. Getting here: Regular flights to Phu Quoc International Airport connect the island to Hanoi and Ho Chi Minh City (Saigon). For locals, the desolate Con Dao group of islands brings up memories of cruel colonial prisons and their inhumane “tiger cage” enclosures. But the biggest (and only inhabited) island Con Son has used its remoteness and lack of development to its advantage, becoming one of Vietnam’s hottest off-the-beaten-path destinations. The beaches on Con Son are part of the draw: white sand and lively waters make beaches like Dam Trau and An Hai a popular draw for visitors. An Hai Beach is particularly popular, given its convenient location near the main town in Con Son; and its picture-perfect look, with the island’s mountains as a backdrop. The scuba diving around the 16 Con Dao islands also represent some of the finest underwater scenery to be had around Vietnam; a dive center on Con Son can give you immediate access to the 20-odd dive sites around the archipelago. Getting here: Regular flights from Ho Chi Minh City (Saigon) and the Mekong Delta’s Can Tho International Airport cross over to the Con Dao Airport on Con Son. A slower (but cheaper) option: ride a boat from Cat Lo Harbor in Vung Tau to Con Son, taking all of 12 hours to reach the island.